The Trio Op.114 of J. Brahms performed by an amazing density, together with the Clarinet Quintet op.115, and the two sonatas for clarinet and piano op.120, represents not only a deserved tribute to the clarinet, but the culmination of his maturity as a composer, being these last works of chamber music that the author wrote. Eight pieces of Op.83 were written in 1908 and can be regarded as the tail of the word romance. Bruch was true to his own musical language and continued until the end regardless of the influences of avant-garde and revolutionary ideas of the late nineteenth and early twentieth centuries. For Bruch, melody is the foundation of a composition and support the emotional expression of music, and a melody inevitable in these works, is the popular tune. 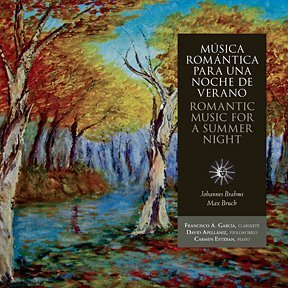 Originally composed for clarinet, viola and piano, this album shows the version of clarinet, cello and piano on the original works adapted by Francisco Antonio García. Great feeling and passion in every minute of this disc that make up the strongest aspect of the Chamber Music for the trio with clarinet, cello and piano.